One of the considerable problems that arise in writing about the Deepwater Horizon oil spill in the Gulf of Mexico comes in determining what information that is given is actually accurate. I’m going to assume however, that when a company provides information to Congress that it is, to the best of their knowledge, correct. 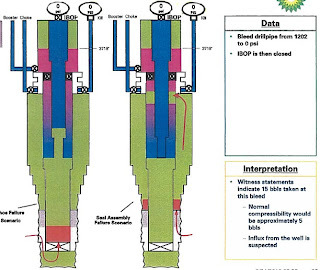 Since the illustrations that accompanied the testimony of BP officials is now available, albeit in draft form, I am going to summarize some of this so that, as discussion and later posts require, it can serve as a useful point to find reference material. This information was presented the Energy and Commerce Committee of the House, on May 24th. (Note that the illustrations have been condensed to fit on the page, clicking on the image should lead to a larger view on a separate page). 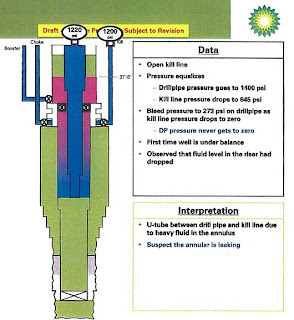 There are several points that I want to highlight, and so I will be taking selected parts of the BP slides to record separate pieces of information. The first of these is where the actual pay zones of oil and gas are, relative to the total depth of the well, and what the pressures are within them. Notice that the pressure at the bottom of the well is about a thousand psi lower than I had been using in earlier posts. There are several different parts of the overall structure for which more information is available in these slides (and my many thanks to several folk that have pointed me to their existence). Consider first the Blow-Out Preventer, on which I have focused recently. The exact nature of the different rams is not the same as that illustrated by the paper from which I took the illustration. LAP – Lower Annular Preventer - down rated to lower wellbore retaining pressure to 5,000 psi. BSR – Blind Shear Rams – cuts through the pipe and seals the well. 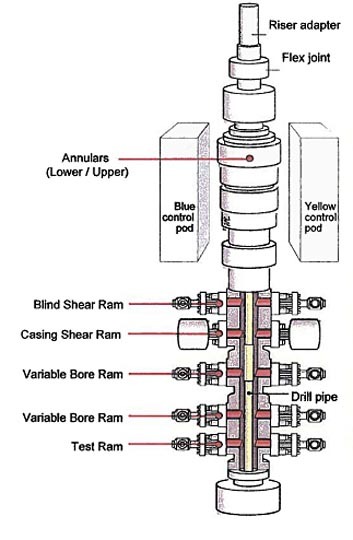 2 rams, one on either side of the drill pipe (DP). CSR – Casing Shear Rams – non sealing, cut drill pipe and casing, but not designed to seal the well. UPR – Upper Pipe Rams – Ram packers can close on a range of drill pipe, from 3.5” OD to 6 5/8” OD and seal at 15,000 psi well bore pressure. 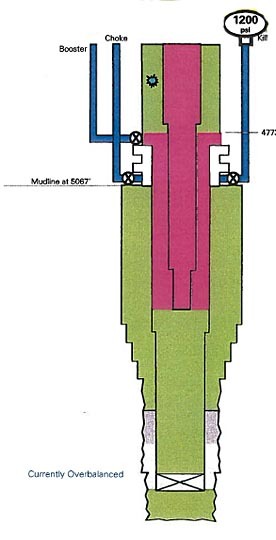 MPR – Middle Pipe Rams - Ram packers can close on a range of drill pipe, from 3.5” OD to 6 5/8” OD and seal at 15,000 psi well bore pressure., can also be used to hand-off drill pipe to a maximum weight of 600,000 lb. LPR – Lower Pipe Rams – A Test Ram that can hold up to 15,000 psi. The lowest ram did not function, I believe, and there was evidence of hydraulic leakage which has raised questions as to whether, or which, of the other rams functioned. 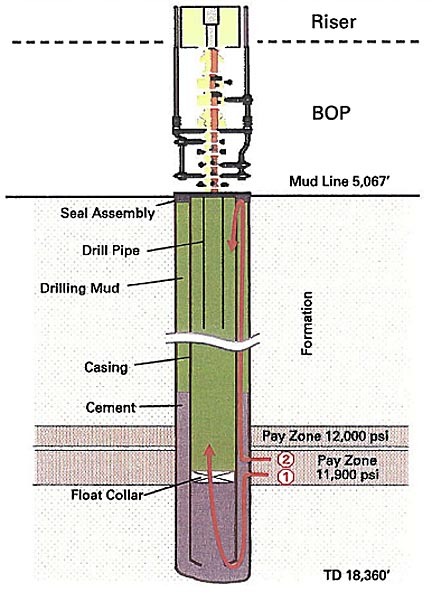 However, as a part of the protocol for the positive pressure test, the drill pipe is lifted out of the BOP, and the BSR is closed to seal the well, while fluid is pumped into the well through the kill line, to raise the pressure and ensure that the cement job had held pressure. That test was successfully completed. Following the positive pressure test the drill pipe is lowered back into the hole, note that it is in three sizes, as it goes down the well, with the upper segment at a diameter of 6 5/8” , and the lowest at a diameter of 3.5” bextending down to 8,367 ft below the rig. 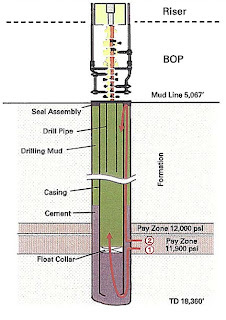 To separate the seawater that is then going to be pumped into the riser a special, heavy mud known as the Lost Circulation Material (LCM) which has a weight of 16 pounds per gallon (ppg) is injected into the well, through the DP, and it circulates from the bottom of the DP back up to the BOP. 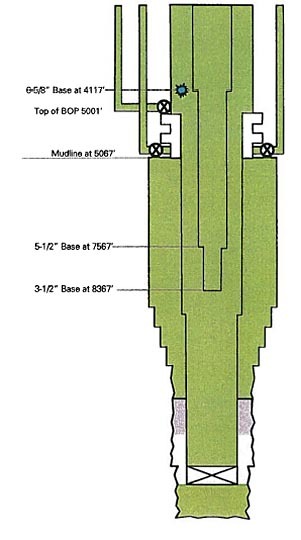 The choke and kill lines had been filled with seawater, and the kill line pressure gage was still reading 1200 psi. (This takes the time to 16:28 on the 20th April. The green color is 14 ppg mud, the pink the 454 barrels of 16 ppg LCM, and the blue is seawater at 8.6 ppg. The sea water is pumped into the well and circulated behind the spacing LCM, material. 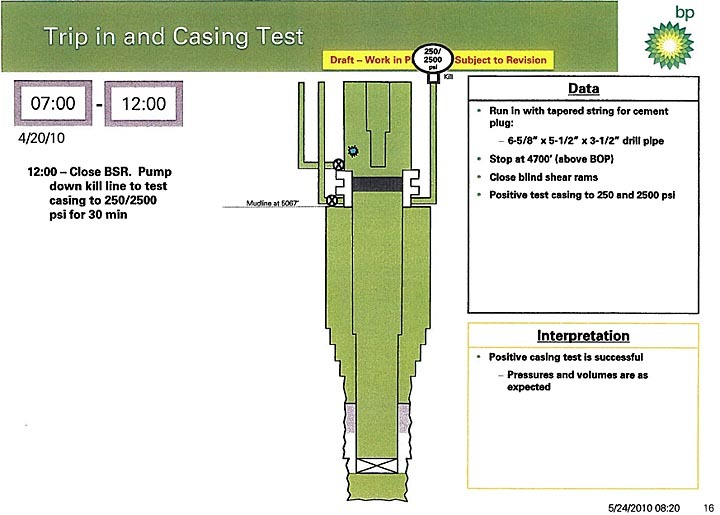 Once it has filled the drill pipe, and started to rise back up the production casing, the pressure rating of the water in the DP is at 2325 psi, and that in the kill line is 1200 psi. 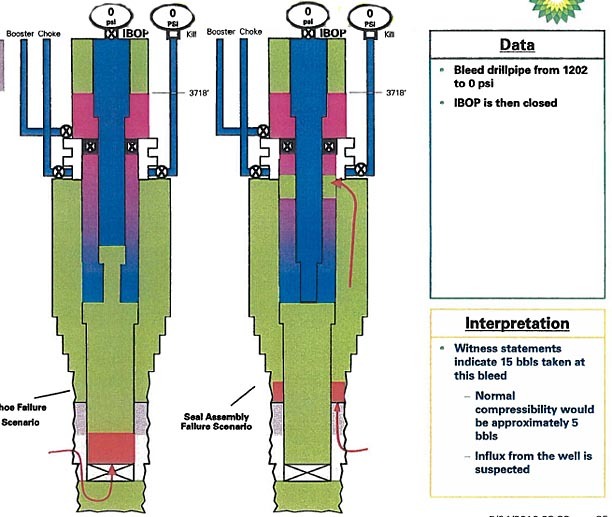 The annular seal is closed around the BP, and the pump is switched off. 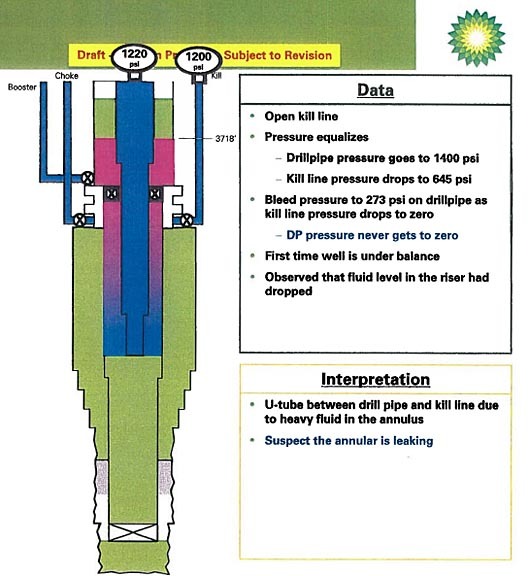 The pressure in the DP (on the rig floor I imagine) is reduced to 1200 psi, to equate with that of the kill line. Once the two are at the same pressure the kill valve at the BOP is opened, but this is where, at around 5 pm the first signs of a problem appear. The fluid in the well, for the first time, exerts less pressure on the fluid in the rock, than the value of that pressure. The annular that is leaking is, presumably, the annular seal at the top of the BOP. The term “U-tube” I believe refers to the fact that there is not a pressure balance at the point it is measured. At this point there are two separate scenarios as to how fluid starts to migrate into the well, as the pressure in the DP is bled back to zero. It is now 17:52. 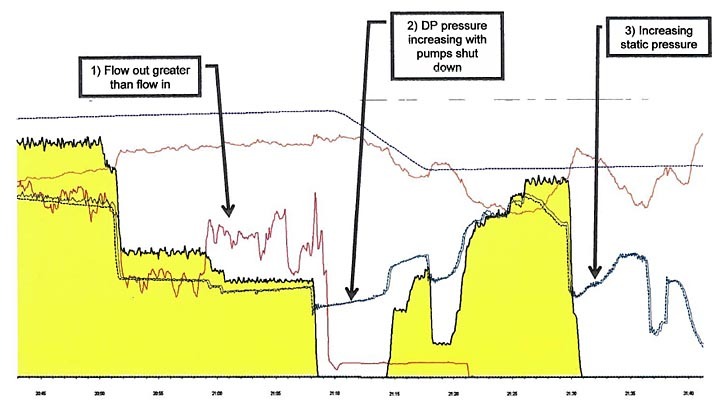 Note that the oil/gas flow is shown as an orange arrow and in either case has a path to the bottom of the DP. Pressure in the well now starts to rise, fluid is flowing from the kill line (about 3 – 15 bbls, the kill line was closed. 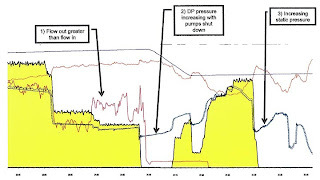 Pressure in the DP was monitored and held steady at 1,400 psi, This was the negative pressure test, at 19:55 the decision to continue pumping seawater was implemented, at 20:58 it was noted that the flow out was greater than the flow in. The flow meter indicates that the well is flowing. Pressure in the DP continues to build, even after the pumps are shut down. The first indications of this flow was 51 minutes before the explosion occurred. Seawater displacement restarted, at 21:14 and at 21:56 the Emergency Disconnect System (EDS) was activated, which should have led the shear rams to activate, and released the riser from the well. It did not work. 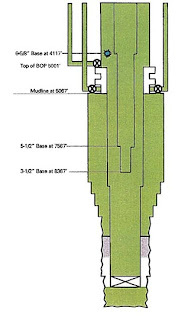 The gage results leading up to the explosion were provided. The activation time for the EDS should be 46 seconds. 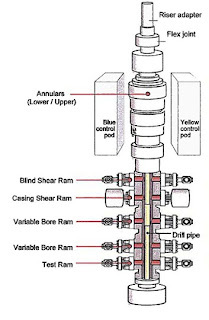 In this time, after the EDS button is pushed, the blind shear rams close, cutting the drill pipe and sealing the well. The sequence is complete and the rig can move away from the well. There is no evidence that the EDS fully activated. Even if hydraulic power to the BOP had been lost there was a second procedure, the AMF, that should have sensed the loss in power, communications and hydraulics and closed the blind shear rams. But it required all three to have been lost to activate. It should take 37 seconds. There is no evidence that it fully activated. The subsequent use of ultrasonics and gamma ray examination suggests that the blind shear and VBRs may have functioned, and could have reached the locked (closed?) position. 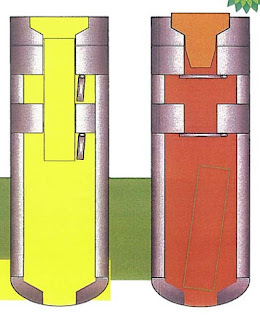 The testimony also showed a simplified version of how the shoe at the bottom of the casing should act to stop re-entry of fluids into the bottom of the production casing. The flappers stay open as first mud, and then cement is pumped down the well. Once the plug reaches the well, and all the cement has been ejected, then the flappers swing back horizontal, sealing the well. (The testimony pictures has the flapper in the wrong place in the middle figure so I deleted it from this copy). Why can't the BOP be frozen? I bet that's been discussed over at Oil Drum. I'll go search it. Thanks again for explaining so much.